Why haven’t Muslims in America and Europe come out of the woodwork by the thousands to provide the identities of jihadis at their mosques, Islamic schools, and neighborhoods to law enforcement? The reason is the same as it always is: it is a violation of Sharia (Islamic Law) – the guiding doctrine which drives Islam and the Muslims who submit to it. But Apostasy is not simply “converting out” of Islam. It is much more than that. It is a capital crime in Islam for Muslims to deny Sharia in any way. Islam is Sharia and Sharia is Islam. In the West there is a reason why the Muslim community is not helping law enforcement at the local and federal level. It is because it is unlawful under Sharia. It is all about Sharia. Specifically, the Islamic Laws of SLANDER and TALEBEARING are clear and make it impossible for Muslims to help law enforcement officials against other Muslims without putting themselves at risk. This is why people who draw cartoons or make movies about Islam are at risk of being killed. Muslims follow sharia because that is what being a Muslim means – someone who submits to Islam. Submitting to Islam means obeying the Sharia of Allah. Muslims risk their lives under sharia if they help non-Muslims against the Muslim community. The threat of death makes many people comply – as evidenced by the fact the Muslim community is silent in the face of a global holocaust except when it is to attack the non-Muslim world. Rossini’s finale of his William Tell Overture conjures the quintessential “movement” for dealing with Islam once-and-for-all. First, gain the attention of America’s throng of mercenary presstitutes by ending further debate with their ad-revenue enhancing Muslim-Brotherhood allies, then (per the following) simply cut to “The Chase”. 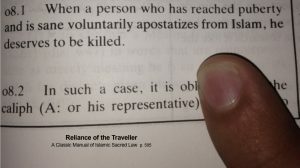 I.e., as a supplementary element to those which currently comprise the crime of treason per the United States criminal code, add “SHARIA ADHERENT; thence — pending deportation — incarcerate any Muslim who is; and who, thus, clearly embodies a perpetual threat to U.S. National Security, and an existential (ongoing) threat to the lives of the American people. Too, since the largest international gambling & “show business” cartel on the face of the earth (the NFL) recently refused to allow a commemorative gesture by the Dallas Cowboys to honor said city’s fallen police officers (who died in the line of duty recently, so that others might live) perhaps said organization (by virtue of having had second-thoughts) may be willing to fund brief bi-weekly national TV & radio public service announcements regarding the ever burgeoning threat to our Constitution, thus freedoms, which the current invasion of non-vetted Muslims et al represent.